If you have been enjoying playing the beta development stage of the new Overwatch game created by Blizzard, you might enjoy this Overwatch tips and tricks video which has been created by Rhys Sutheran Online Content Producer at SCEE. If you haven’t had a chance to play as yet, Overwatch is Blizzard’s new team-based shooter featuring wide variety of heroes, maps and game modes to choose from, and enjoyed a recent open beta gameplay phase that took place from May 5-9th 2016. 1.) It’s a little bit MOBA, a little bit FPS, and more… Overwatch refuses to be pigeonholed by players expectations of first-person shooters. While all-out carnage is by no means off the agenda, there’s more to it than picking the most powerful hero and charging into battle. Each round will give your team an objective to complete within a time limit — like capturing an area or escorting a payload across the map — and an array of heroes with a huge variety of skills to pick from and learn. 2.) Squad Goals. – You’re all working towards the same objective and getting the sweet taste of victory is only going to come from a well-balanced team. During team selection you’ll be advised if your squad is unbalanced and lacking in certain areas — and it’s wise to heed this advice to make sure every base is covered when the match starts. 3.) Play to your strengths. – Heroes are roughly grouped together for their skills in offense, support, defense, or as a damage-absorbing tank. Don’t just learn your hero’s attack moves; the L1 and R1 buttons generally contain more interesting special abilities to get a tactical edge, like healing, laying down turrets and traps, moving to vantage points, and much more. Thinking that every character is there to deal damage can be a big mistake. 4.) It’s not all about the kills. – At the end of each match, players are invited to vote on their teammates’ performance and select an MVP. But a player’s value isn’t just down to how many enemies they’ve dispatched — everything you do counts towards the common goal, from healing to building turrets to assisting your damage-dealers with essential buffs. 5.) You’re not tied to one hero. – If your team feels unbalanced — or you’re just getting pulverized as your currently selected character — you won’t have to suffer for the duration of the game. If you die, or trek back to your spawn room, you’re free to switch it up and select a new hero to carry on the fight with. 6.) Pay attention to the opposition. – It’s easy to be blinded by the opposing tanks and offensive players who are causing all the aggro up front and forget about the supporting cast. Take down the opposing team’s ability to heal or resurrect (if they have someone playing as Mercy) and your squad will see the difference. 7) Learn how to contain Bastion. – Even if you only play a handful of games, chances are your early experiences of Overwatch will be peppered with takedowns at the robotic hands of Bastion. He can deal a whole heap of damage very quickly, especially in turret mode, but he has a critical weak spot too; watch out for corners and covered spots where he might set up as a sentry bot, and try to get an assassin behind him. 8.) I like the way you move. – Pick a hero with special movement abilities and a whole new tactical dimension opens up in attack and defence. Widowmaker’s grappling hook or Pharah’s jump jets are great for finding high, hidden nooks to snipe from, while characters like Tracer and McCree can quickly rush across short distances on the map. See a puff of smoke where Reaper is standing and chances are he’s about to teleport behind your lines and take you out at close quarters. 9.) There are a lot of maps. 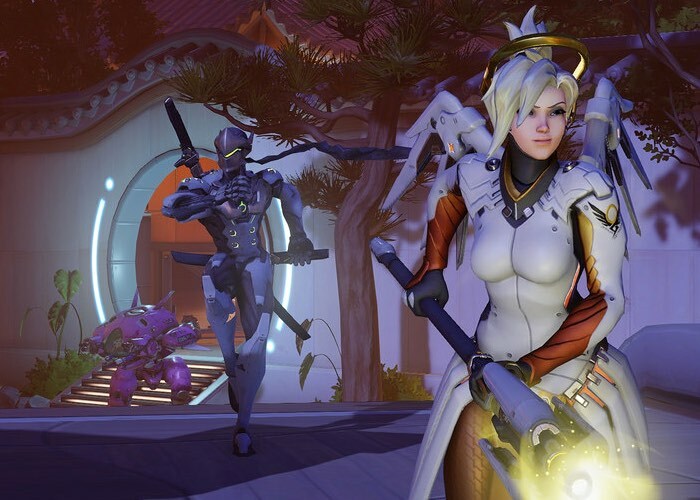 – Rounds in Overwatch can be relatively short — but there’s enough variation in the settings that even in lengthy gaming sessions, map fatigue didn’t set in. All of the locations are filled with cut-throughs, pinch points, and elevated sections, so you won’t feel like you’re being funnelled down a channel towards an objective. 10.) All heroes are created equal.- But what you do with them can set a good team apart from a bad one. There are no character upgrades or power progression, so everyone has the same skill sets to pick from — you won’t come up against players who have unlocked countless perks to unbalance the match.